Formerly called D & K Cini Plumbing, we have recently rebranded! The “D” was for “Darryl” — He’s the man on the tools. The “K” is for “Karen” — Darryl’s wife (and the brains behind the operations). Having traded as D & K Cini Plumbing since 2008, the decision came in early 2016 to simplify it to Cini Plumbing & Gas. Cini Plumbing & Gas may be their new name but it is still Darryl and Karen at the helm of this customer service focused, local business. They continue to offer quality plumbing, hot water and gas fitting services throughout Central & North Brisbane, Strathpine, Caboolture and surrounding areas. Darryl has also become a service agent for Dux Hotwater from the Brisbane River, to Gympie and Gatton. Amongst adding other offerings to their plumbing services list, Cini Plumbing has established a strong and enviable reputation in the local area. Now with 2 children, Cini Plumbing is a true family business proudly offering a very high standard in residential plumbing and commercial plumbing and gasfitting services at an affordable price. 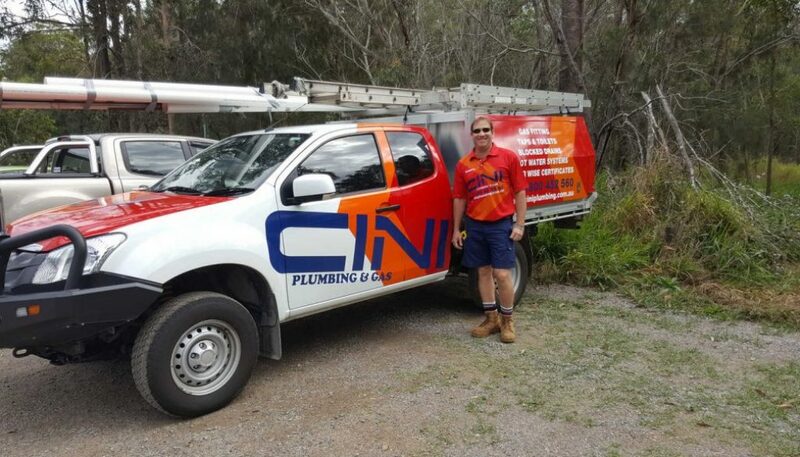 Keep a look out for the newly sign written Cini Plumbing work ute! It’s likely Darryl will be on his way to install a new hot water service, fix some leaking taps or attend to a blocked drain. Be sure to contact Cini Plumbing for all of your plumbing and gas fitting needs. All of your Plumbing & Gas Problems are SORTED! with CINI PLUMBING!